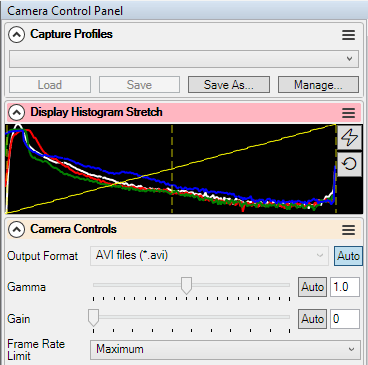 SharpCap 3.1 automatically saves camera settings when you close a camera and then restores them the next time you open that camera. This behavious is enabled by default, but if you prefer to return to the old way of working, the auto-restore can be disabled in ‘general’ tab of the SharpCap settings. SharpCap 3.0 contained integration to ‘Astrometry.Net’ based local plate solvers, but it required you to have a connected ASCOM mount as it used the mount pointing as an initial estimate of location to allow the plate solve to complete quickly. SharpCap 3.1 also contains blind plate solving (on the tools menu) which does not require a connected mount, it will just run your local copy of AstroTortilla/ASPS/AnSvr on the next frame and show the results in the notification bar.